The Granite Gurus: FAQ Friday: Can you backlight onyx? FAQ Friday: Can you backlight onyx? And in my opinion if you are going to spend the money on onyx you may as well put some lights behind it. Working with onyx alone isn't easy. It's a more difficult stone to work with for many reasons. Throw backlighting into the mix and it makes it even more difficult. Backlighting onyx isn't just throwing whatever light you want behind it. I've seen many backlit onyx pieces look horrible and it's sad because I'm sure the homeowner paid good money for the stone and the fabrication/ installation. 1) Make sure the onyx is transparent enough. Some onyx slabs just won't show the light well. I use a flashlight to test all areas of the slab before committing to backlight it. 2) Choose the correct lights. I have some secrets of the best lights that I'm not going to share here (sorry, sometimes I just don't feel like helping out my competition). All lighting is not created equal. You want a nice soft, overall glow. You shouldn't be able to SEE the lights, unless it's a design decision that you want to and you have them carefully designed and placed. One more hint....make sure they are lights that last awhile. You don't want to be going through the hassle of changing them all the time. Also on that note, make sure you have access to change them. Seems like common sense right? Unfortunately I've seen people forget that small step. 3) Work with an experienced and reputable fabricator. You will pay more for this fabricator, but I promise it will be worth it. There are tricks to placing the lighting and installing the slab. There are tricks to choosing the right slab of onyx and fabricating the piece. All of this knowledge costs money. Sorry, but you get what you pay for in the stone industry. 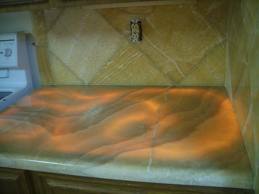 Here's a picture of a poor installation of backlit onyx countertops. I'm not going to credit this photo because I got it from the fabricator's website and...well, I shouldn't embarrass them. You should NOT be able to see the strand of light like this. I wouldn't be proud and showing this off on my website if I were them. Just sayin'. Beautiful! I can definitely see what you are talking about though...that poorly lit countertop looks like crap. I'd be so mad if I had paid a lot of money for that! Very cool. I didn't know you could put lights behind onyx. This is a great post, thanks for sharing. Backlighting onyx is not easy, or cheap, and it makes sense to do it the right way!! Thanks for the link to your blog. I really like those panels and will definitely be contacting you in the future! I am really interested in who you do business with for your LED lights to back-light the onyx with. The company I work for has a lot of man hours invested into working with contractors to make some very creative solutions to this exact same setup and it seems to be growing every month. I would really love to try to share more information about the different color temperature lights and the warranties we apply to them. Let me know if this is something you may be interested in. Yes, I am interested in more info on the led lights. Send me an email stephanie@mgsbydesign.com.